It's been a very busy and full day, beginning just after 06:30 when we went down to breakfast at the hotel, having woken fairly early due to the jet lag. We spent the day exploring Brooklyn with David D., who I've known for maybe 25 years or so, and who had moved to New York to live with his American wife nearly 20 years ago. David is a keen photographer, and has published two photo collection books on New York: As Seen in Brooklyn, and Manhattan: Top to Bottom. I woke up before 04:00 with jet lag and couldn't get back to sleep, but M. slept until about 06:00. We went down to breakfast at the hotel soon after it began at 06:30. The buffet selection included cereal (corn flakes and raisin bran), bread for toasting, bagels, pancakes, boiled eggs, sweet pastries and doughnuts, yoghurt, and bananas and apples. We stuck to cereal and bagels and fresh fruit. M. tried another coffee from the automated machine in the lobby but after one sip decided to stick to a hot chocolate instead. We walked over to a subway station near Times Square to get some tickets and then catch a number 3 train to Grand Army Plaza in Brooklyn. We tried to buy Metrocard tickets from a machine, but it wouldn't take my Amex card because I couldn't enter a valid US ZIP code. So we had to pay cash to a lady in the booth. Don't they think of foreign visitors when designing the ticket machines? We arrived a bit early, but David was there waiting for us. He took us out and past the Grand Army monument towards Prospect Park. Along the way he informed us of a lot of the history of Brooklyn, which was interesting and a great way to understand the area a bit better. I felt a bit like we were Anthony Bourdain or someone from a travel show, getting the inside story about the place from a local, which was awesome. The morning was hot with the sun beating down out of a clear sky, but thankfully nowhere near as humid as last night. We ducked from shade to shade under the trees in the park. 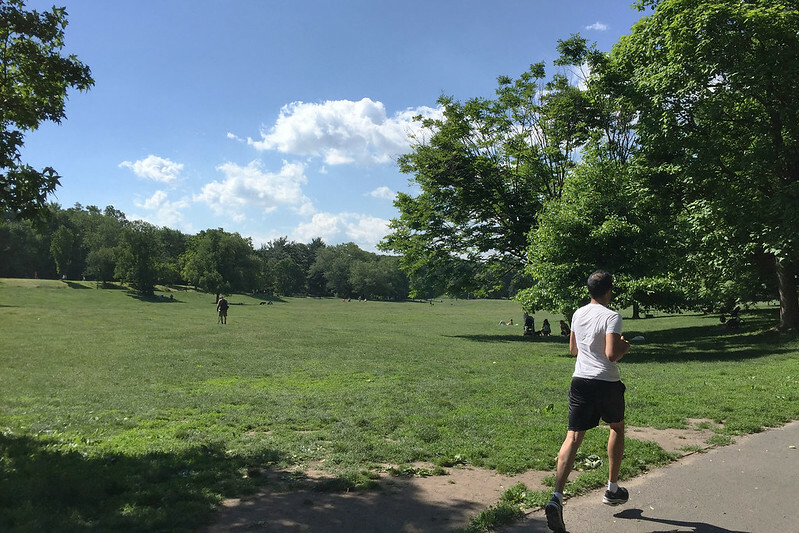 David said it was designed by the same guys who designed Central Park, but Prospect Park was much more raw and wild in appearance, with rolling hills and large stands of trees which looked more natural than designed. 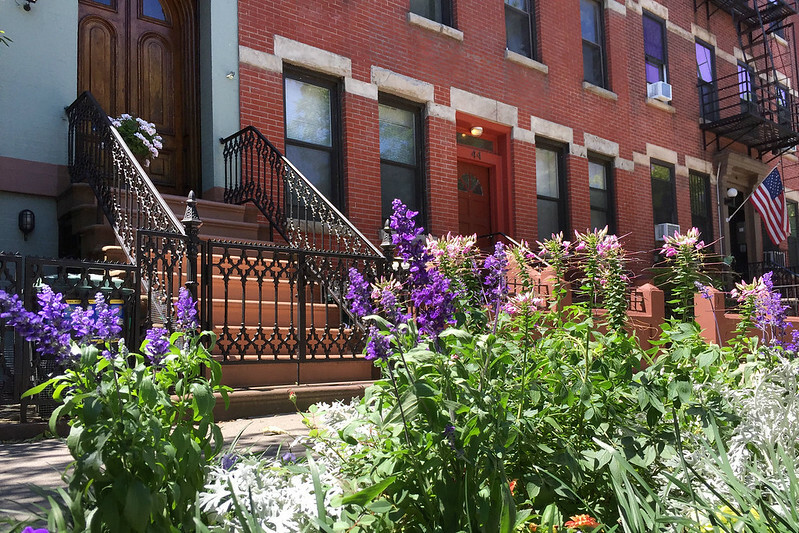 After a while we headed out to a street and walked roughly east towards downtown Brooklyn, through the Park Slope neighbourhood, passing along leafy streets lined with brownstone houses. We stopped on a side street at a place called Cocoa Bar for some cool drinks. David got a large iced chocolate, which sounded good so I asked for one too. M. got an iced latte coffee. The "iced chocolate" was very different from what you'd get in Australia by that name, as it was more like a very dark chocolate milk, just with ice cubes, and none of the cream or ice cream we would have. It was richly chocolatey, but not very sweet, which was good. We swapped stories of what we'd each been up to for the past 15 or so years since we'd seen each other. After sitting for a bit to cool down we ventured out into the heat of the day again. 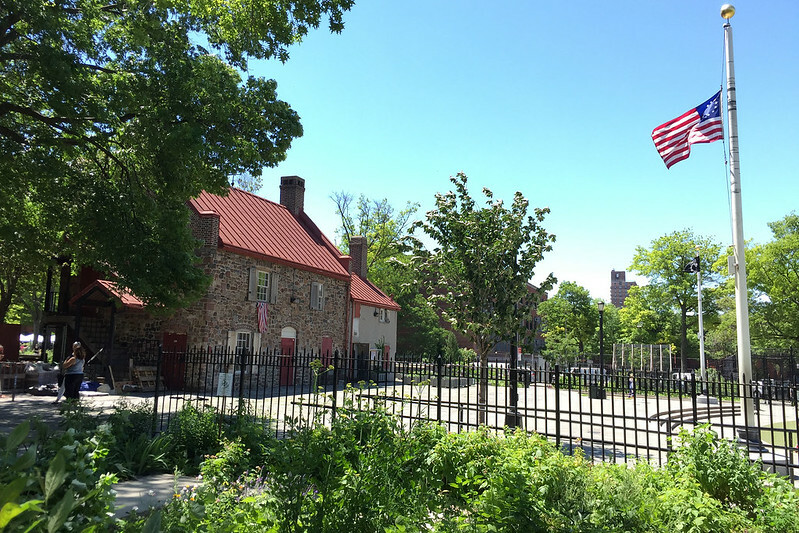 We came across the Old Stone House, which played an important part in the American Revolutionary War. It was the site of a major British victory in the war, which saw General Washington retreat from Long Island and New York. David said most Americans didn't know anything about it, as they only learnt about American victories in the war. He also told us about the house's later history as the clubhouse of a baseball field, which had now been converted into a children's playground. Nearby was a small farmer's market selling produce and food items, which we walked through to approach the Stone House. At the Old Stone House itself we went inside to see the museum displays. A lady at the entrance told us there was a reception on inside for a piano recital, but we could still go in and look around. There were people having drinks and snacks in there, but we just looked at some of the displays, including a large map of the Battle of Long Island. David also found some old photos of the baseball field to show us as well. From here we walked through a few blocks of more industrial landscape in the neighbourhood of Gowanus, crossing the Gowanus Canal, which David described as somewhere you really didn't want to go swimming. 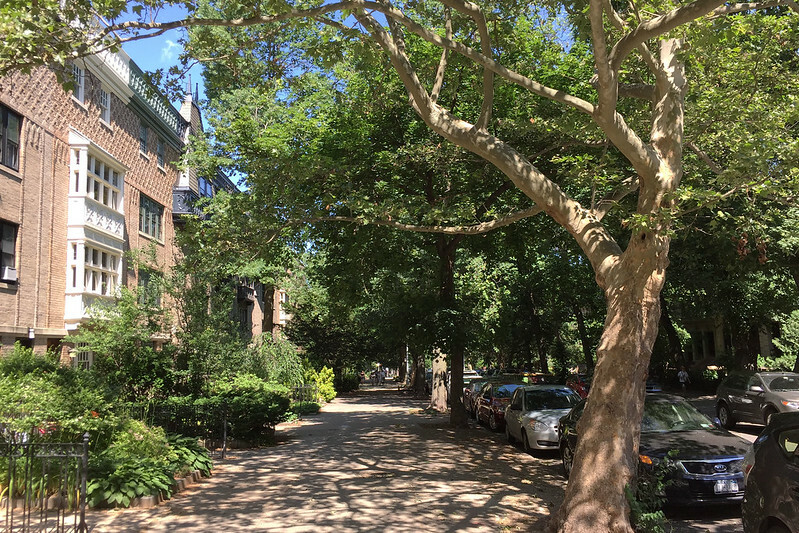 We ended up on another street lined with shops and restaurants, in the neighbourhood of Carroll Gardens. Here we stopped at a place called Zaytoons which did Lebanese food. M. had a plate of falafel, hummus, labneh, fried haloumi, a boiled egg, and some beans, while I had a plate of fried spicy sausage and potato, topped with a couple of poached eggs. It was all delicious. We continued to a nearby subway stop and hopped on a train headed towards Coney Island. David told us to get off at a stop which was elevated above the street, which gave a good view of the buildings of Manhattan across the river, then we got on the next train to continue our journey. David left us a couple of stops later, but we continued on to Coney Island at the end of the line. At Coney Island we explored the large amusement park. The weather was harsh, with a combination of relentless sun, very little shade, and a hot blasting wind. 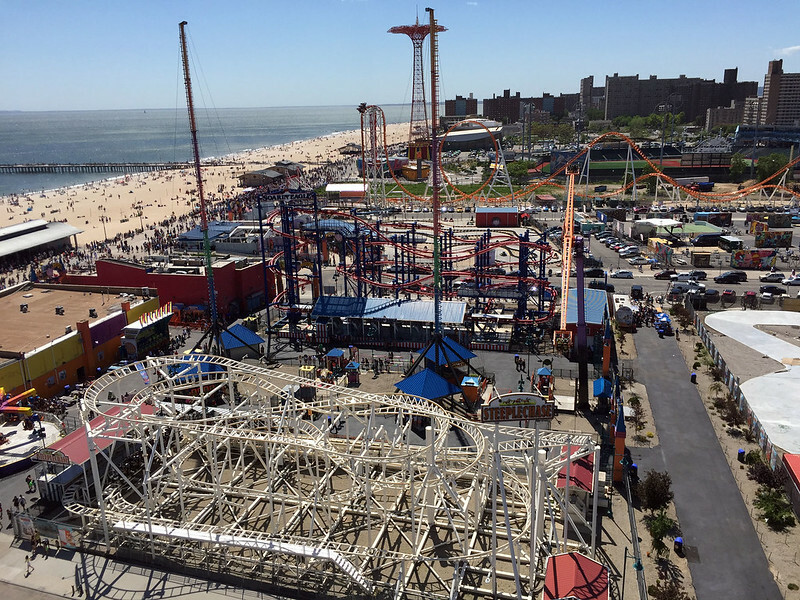 View over Coney Island from the Wonder Wheel. Our first stop was the Wonder Wheel, a Ferris wheel which had stationary cars attached to the outer rim and "swinging" cars which were on rails and occasionally dipped and swayed as the wheel rotated. We paid $7 each and got a stationary car as a smoother platform for viewing and taking photos. After being loaded into a car, we went around twice, getting good views over Coney Island and all the various rides, as well as nearby parts of Brooklyn. After riding the Wheel, we walked through the various side show games and dodgems and so on. M. got a lemon Italian ice as a cooling refreshment; it was very nice and welcome in the heat. 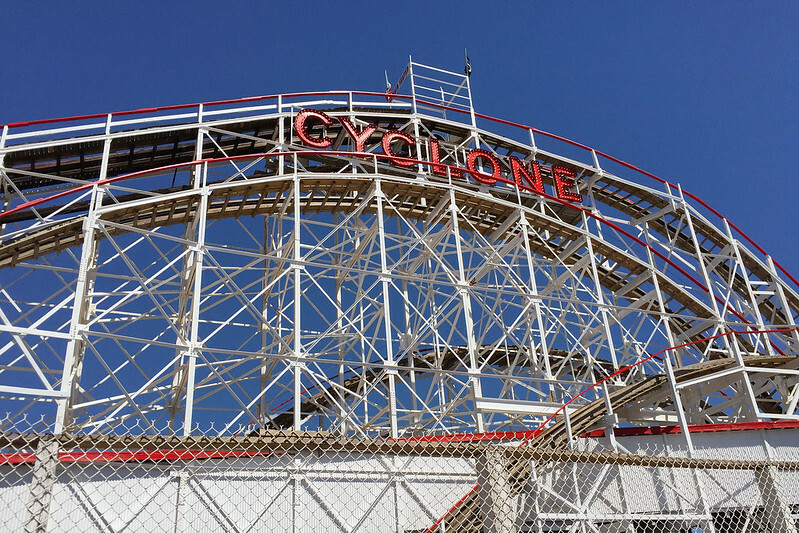 At the west end of the amusements was The Cyclone, the old wooden roller coaster. We decided to have a ride on it, which cost $10. There was no queue for the ride and we left our bags at the bag check and climbed into the third seat from the front of the train. The ride was a bit jerky and noisy, but lots of fun going up and down the various steep hills. I tried to video the ride on my phone, but discovered only later that I had messed up and not recorded any of it! 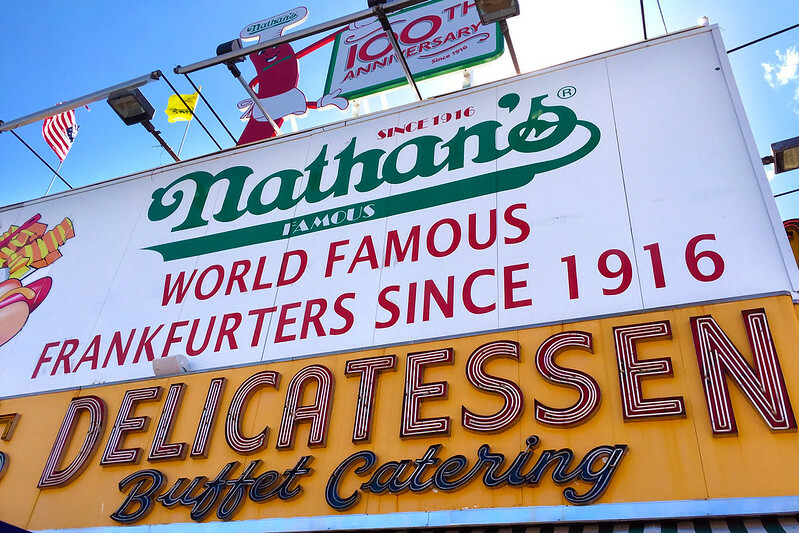 We walked back towards Nathan's Famous, the historic first hot dog stand in America, built in 1916. Naturally I had to try a dog, and got a plain one with sauerkraut, topping it with mustard at the condiment bar. It was a fairly small hot dog, which was good because lunch had been very filling, but it actually tasted pretty good. We caught a train back to Manhattan, stopping at Prince Street to check out the Goorin Brothers hat store there. 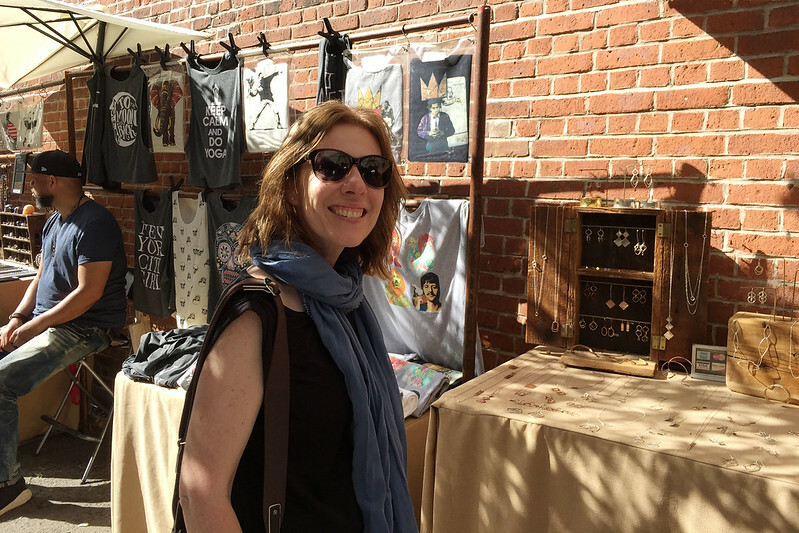 On the way, was passed a small street market, the Nolita Outdoor Market, with stalls selling hand made jewellery, knick-knacks, clothing, and so on. One guy was selling T-shirts with images of classic cameras on them. I got one with a Canon AE-1. (I picked up a business card, learning that the guy operates under the name of Camera Monster.) Then at Goorin Brothers M. bought a dark chocolate brown hat. Nearby over on the parallel Spring Street was Balthazar, a place which had been recommended to M. On the way there we passed Lombardi's, the first pizza place in New York, in 1905. 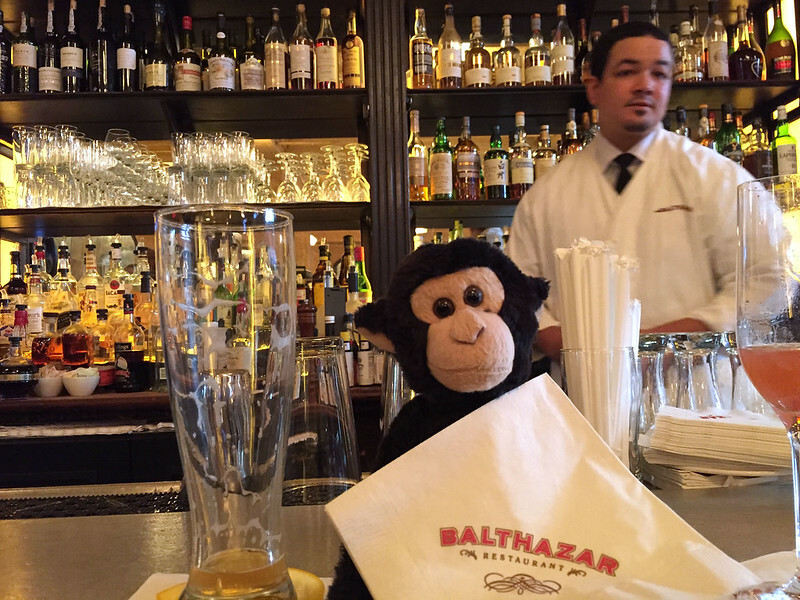 We asked if we could book a table for dinner, but they didn't take reservations, so we decided to go to Balthazar for a drink and then return to wait for a table. Enjoying a drink at Balthazar. Balthazar is a slightly fancy French place, with restaurant tables and a bar down one side. We waited for a spot at the full bar, and about five minutes later a couple left and we grabbed their seats. We checked out the cocktails and M. chose a champagne au fraises, while I chose a Heisenstephan beer, which I thought sounded like a wheat beer, and turned out to be so. A guy sitting next to me was having a meal at the bar, beginning with a plate of snails. Another guy next to him had to show him how to extract the snails from the shells by tapping them on the iron skillet, rather than trying to dig them out with a fork. After finishing our drinks, we walked back to Lombardi's and requested a table. We were given a buzzer and told the wait would be about ten minutes. We walked up a street for a short block to look around before returning to wait. Soon the buzzer signalled us to enter and we were shown to a table downstairs in the basement, in a small room with about half a dozen other tables. We ordered a large margherita pizza, and I got a glass of chianti. 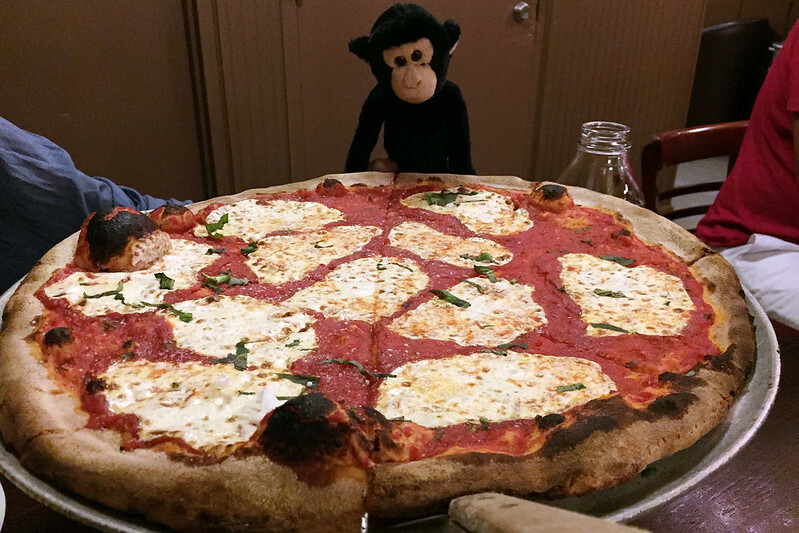 The pizza came on a huge tray, cut into eight giant slices. Interestingly, we got paper plates to eat from, but proper steel cutlery. The pizza was thin but the crust had a nice chewiness to it. The tomato sauce was quite thick, covered with thin slices of mozzarella, and topped with shredded fresh basil leaves. It was pretty good, though honestly not as good as I'd expected from the oldest established pizza place in the country. On some slices I sprinkled dried chilli from a shaker that was on the table with salt and pepper. After finishing the pizza, we walked back to our hotel, mostly along Broadway, then taking Sixth Street when they intersected. We passed a pharmacy and M. bought some conditioner while I got some Old Spice deodorants to fulfil Andrew's request. We also got a chocolate and walnut cookie for M. from the small bakery attached to Balthazar as we walked past it again. On the walk home the wind had picked up and it was a bit unpleasant to walk through, as it blew strongly at every cross street. We passed the Flatiron Building and stopped to get some photos, and then later walked past the Empire State Building, which had queues of people waiting to pay $32 each to go up to the observation floor. It would have been nice to go up, but we didn't want to wait in the queue and end up getting an even later night. Eventually we returned to our hotel, where we turned in for the night. Last updated: Saturday, 25 June, 2016; 14:37:21 PDT.